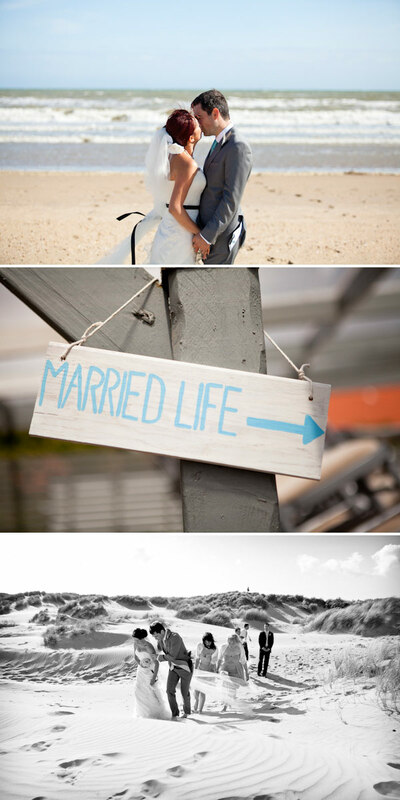 Ross and Kelly wanted their East Sussex W-day to be a fusion of “relaxed vintage-inspired beach” with a Rye town hall ceremony and canapes in the sand dunes. There are so many things I love about this dreamy affair I can’t even begin to tell you. 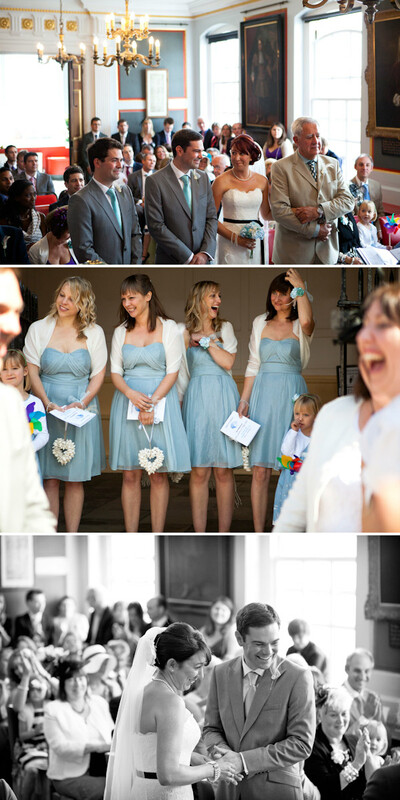 Oh ok, go on then – here’s a few: pale blue chiffon, multi-coloured windmills, hearts made of seashells, bright red hair, buttonholes made of feathers, bouquets made of silk, an old Porsche, the look on Kelly’s Dad’s face, kisses in the salty air…..
And we haven’t even got to the reception yet. All of the beautiful images are courtesy of David Long Photography. I’m a heels girl all the way so they had to be meaningful! I had vintage style peep-toe ivory 4 1/2in heels, by Rainbow Club. The shoes were probably the hardest thing to find but it was worth the trawl because they were perfect and I still love them! Regards hair & make-up, I had a really clear idea of how I wanted it from the beginning, something feminine with a twist of vintage for my hair which would hold on the beach! It was just a case of finding someone who could do it for me that I could trust which was also fairly easy when a couple of good local friends who have got experience in hair and make-up did a couple of trials with me and helped to create the look! It was finished off with a big camellia just above where my hair was weaved into a big twisty knot. 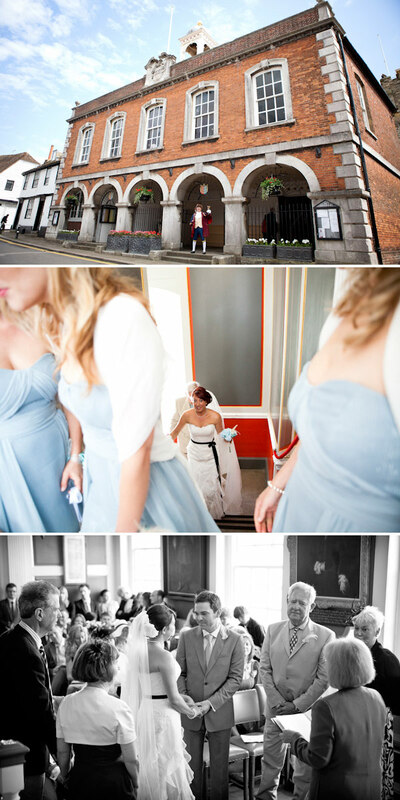 My dress was by Augusta Jones and I found it in Morgan Davies in Islington, London. The whole theme of our day was relaxed vintage beach, of which the vintage and beach elements were quite hard to pair in my imagination but made very easy by Annalise at Morgan Davies. It was actually the very first wedding dress that I tried on and the one I ended up going back to twice before I made a final decision. It was the one that I felt reflected both my own personality but also the personality of our day and I guess the one that made me smile the most when I tried it on! 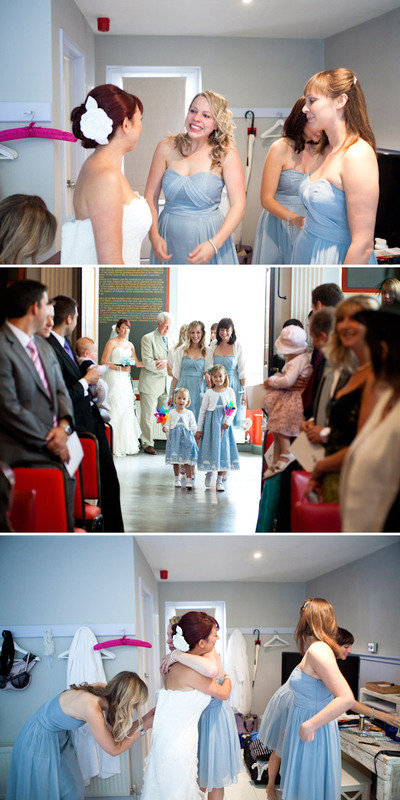 The bridesmaids wore the same dress from Coast and the flower girls dresses were from Poppy on www.notonthehighstreet.com. The brilliant thing about Poppy was that they made us a slightly bigger dress for my niece and around the bottom of the dresses was a fantastic seaside story in pictures which couldn’t have been more on theme! The girls loved them. We went two ways with flowers. My bouquet, the buttonholes, the wrist corsages and brooches and the flower girls hair-bands were all hand-made satin made by Licimo Bouquets who I found on www.folksy.com. 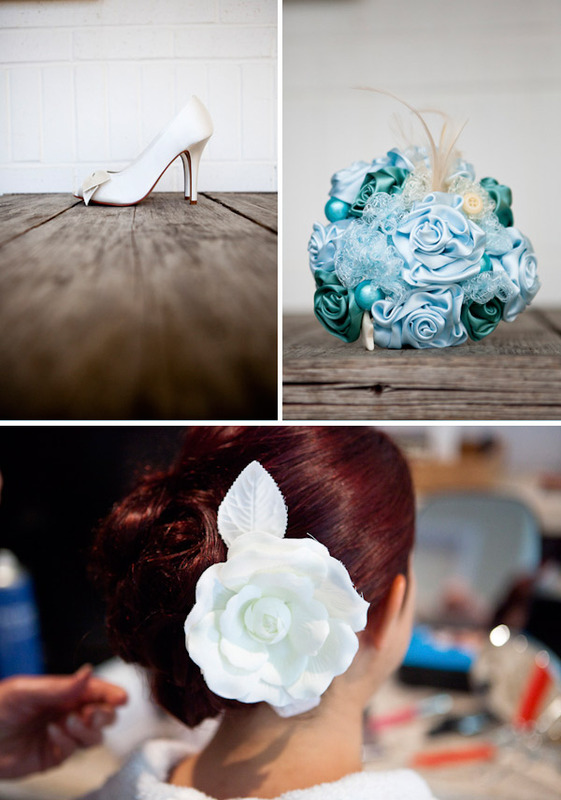 Ana did an amazing job of bringing the ‘vintage’ and ‘beach’ together with the tiny added details which made them completely unique and so totally inspired! And the best bit is that we get to keep them. All of our table decorations & the flowers on the cake were provided by Café des Fleurs in Rye. We had jam jars which we’d had everyone collecting for months which contained a variety of “beachy”, wild looking flowers such as blue thistle, blue nigella, white ranunculus, white agapanthus, blue cornflower & other seasonal “beachy” flowers & foliage. Each jar had natural raffia tied round the top. We really wanted to keep Ross’s attire simple and classic and so we went for a light grey suit from Reiss, elegant black shoes from Ted Baker, a plain white shirt and a mint green tie. It went really well with my cream dress and suited Ross absolutely perfectly. He did have to have decent haircut though! My key ‘bridal’ accessory was a 14ft single tier veil. I think above anything else, the item that made me feel most like a bride, both when trying on dresses but also on our wedding day was the veil. It was quite fine net so although it was long it was actually quite discrete. 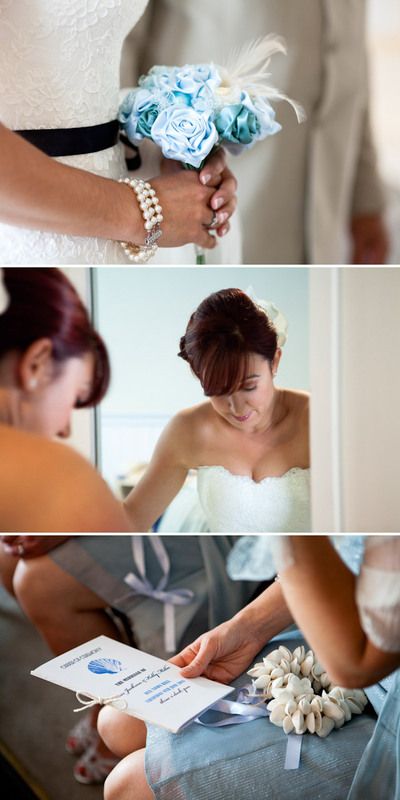 In terms of jewellery, because there was quite a bit of detail on my dress I went for simple vintage pearl items. I found a vintage 3-string pearl bracelet in Snoopers Paradise in Brighton, and I borrowed an antique small single string of pearls from my mother-in-law and a set of tiny pearl studs from my maid of honour. I didn’t have any trouble with the “old & borrowed’ bit! 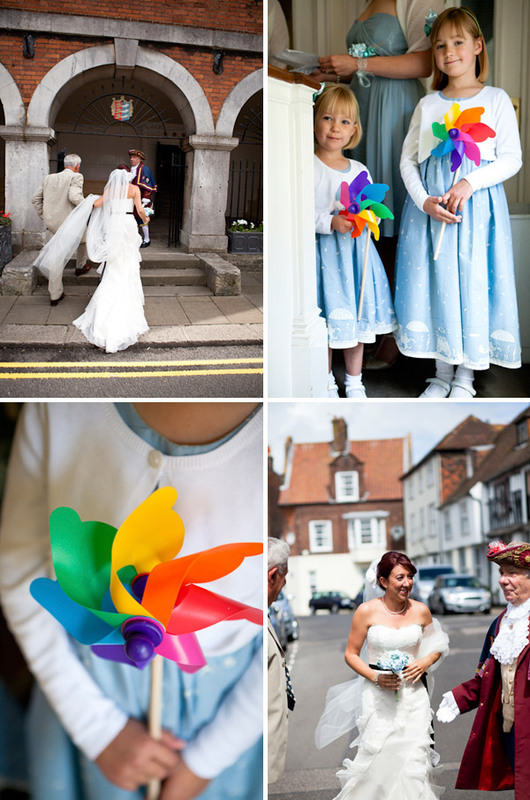 Our Wedding ceremony was held at Rye Town Hall in the lovely cinque port town of Rye in East Sussex at 3pm. Afterwards we had a fun beach picnic for our reception drinks on Camber Sands. The reception is going to knock your socks clean off. Promise. Clean, crisp and cool decor and plenty of delicious details. 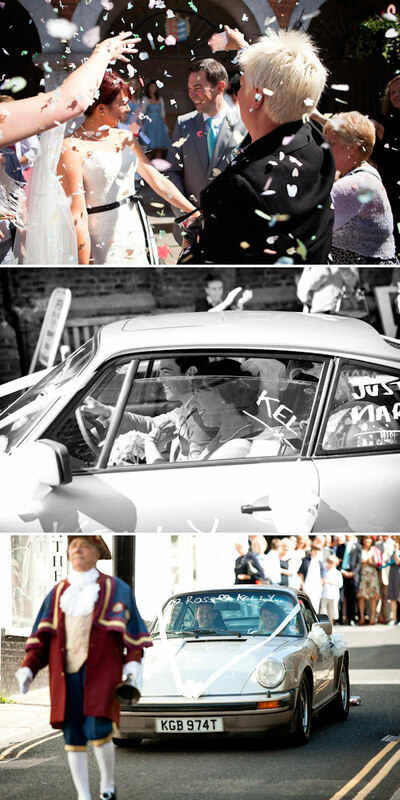 I have serious wedding envy.